This entry was posted on Saturday, September 22nd, 2007 at 11:35 am	and is filed under East End. You can follow any responses to this entry through the RSS 2.0 feed. You can leave a response, or trackback from your own site. 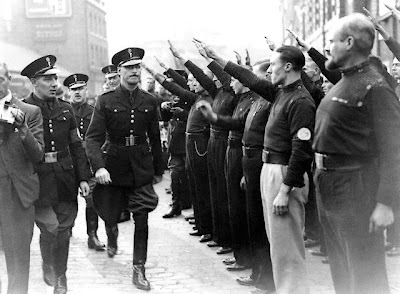 Who would have thought that it would be possible to segue into Paul Simon from Oswald Mosley. I am impressed. that is a very interesting post rob. Billy Bragg makes a big deal out of the Paul Simon/Kathy connection in his book The Progressive Patriot, speculating that he must have changed trains at his beloved Barking Station. Does anyone know where on Cable St. the house owned by Judith Piepe exists (or existed), where Paul Simon lived briefly? I don’t know how I stumbled upon this site but I am having the time of my life reading it. This post is amazing and I agree with Nicola, I didn’t think I would ever read an article that segues into Paul Simon from Oswald Mosley. Utterly fantastic! Thanks for sharing your passion with the rest of us. Re Judith Piepe, I stayed at her place in 1966 with girl friend, later wife, Barbara. It wasn’t a house but a flat and I suspect that it was rented from the council. So if you can track any council housing back you could probably find roughly where it was. 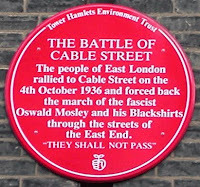 Haven’t been in Cable Street for so many years so don’t remember much more about it. Judith was an amazing character who helped waifs and strays and musicians round Soho – which is how we got put up for a week or so! The flat was a council one and in the block immediately opposite Shadwell Station. Judith shared with Steven Delft, an etherial man who made guitars in a shop (now demolished) a little further down the road. As a teen I drew some concert posters for them but made the mistake of putting comedy names on a rough version (Joan Armourplating) so they stopped talking to me! The small flat where Judith Piepe lived (with lute/guitar maker Stephen Delft) was in a block called Dellow House. I think it has now been knocked down and the area redeveloped. I used to be in a band with Stephen Delft and Judith managed us – before, sadly, I walked out on them (Iwas very young and I regret it.) Judith was an amazing woman – she forgave me, but Stephen never did! Many famous names passed through the flat. Art Garfunkle once opened the door to me when I went round for band practice! Happy days. RIP Judith. I stayed at Judith’s place around 65/6 for some time, I was 17 going on 18 (sounds like a song) and playing at Les Cousins and I think the youngest guitarist playing down at Cousins at the time, John Renbourn used to call me ‘Stevie Wonder’ after you know who. The first week that I stayed there Art Garfunkle come over from the States with his new wife on honeymoon and Judith asked me to play a tune for them whilst they were in bed (on there first morning of marriage), I had just woken-up and being on heroin at the time was not feeling so well. Anyway… I came in (Judith’s latest musical wonder from darkest Soho) and started to play, but suddenly I’m afraid I felt sick and annoyed for no particular reason and promptly broke the guitar over the end of the bed knob of the bed that they were laying in. Well I can’t quite describe their faces other than sheer astonishment. Poor Judith looked on… and well that was that. I have many memories of my time at Judith’s, her great fish curries, Sunday roasts where I picked the mint from the graveyard over the road. The many Fransican monks that stayed there, even one in the bath! there was also more dramatic times during my stay (more dramatic than the above!!!) well yes, I am now starting to write an account of my life during the 60′s and beyond and there is much to tell from Kensington mansion living, Boots at Piccadilly, prison on Lamu Island and much, much more, please let me know if you think it’s worth writing about? I grew up in the same building that Judith live with her son Stephen. Judith and Stephen lived underneath us. I was born in 1966 so was only young. From what I remember of Judith and Stephen, they were very music orientated. Stephen wore kaftans all the time (as a little girl this is what i remember of Stephen) I think that he repaired guitars aslo. Judith was always very nice to me, and would let me go into her flat and she would make me a drink, and give me biscuits. I remember the smell of incense wafting up from the flat into ours..think that is why i like the smell of incense now, it reminds me of my childhood in the East End. Judith and Stephen had the basement of a building in Cable street were lots of musicians used to frequent playing lots of different kinds of musical instruments to which my twin and I used to dance to and try and peep though the railings to see what they were doing. As I recall different memories I will promise to add them. Another little memory..I remember that there were a lot of police running up and down the stairs in our flats and banging on the door of Judiths place…not sure at the time what that was all about. probably somthing and nothing….I remember that i was a little scared as there was so much comotion going on and people shouting..my mum said that we couldnt go out to play at that point in case we got knocked over by all the people running around. In reference to where Shadwell station was, this was situdated in Watney Market, Under the Arches. 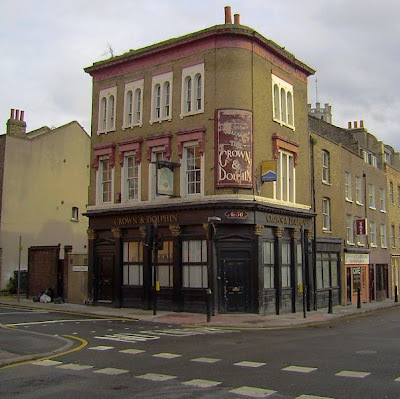 Many years later the entrance got moved to Cable street opposite Dellow House. Dellow House (Flats) sat opposite Bewley House (Flats) these were identical to Dellow house. Inbetween the two buildings was a playground with swings , slides, monkey bars…. There was also a pub called the “The old House at Home”. there was a market almost every day and a wonderfull little pie and mash shop. Mum and dad used to send my sister and i down there with plates and bowls to fill up with the steaming pie and mash on our way there we would have to pass Judiths door, this would be open and the exotic smells would waft out of there, along with the music. I knew Judith and Stephen in the early 1970s. I played in a band with Stephen called ‘The Patriarch of Glastonbury – His Band’ (we had a residency at The Marquee in 1971). J was a remarkable woman with a huge heart and love of music. Happy days! I also knew Stephen and Judith in the early 70′s. 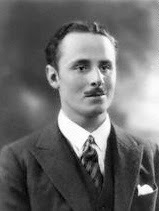 Judith had taken a young lad under her wing, Patrick wheeler who lived in 10 Dellow house. Kathleen may remember the wheeler family above, I met Patrick at school and Judith became our manager, she got us a lot of gigs on the London folk circuit. She named our band Fireweed and also wrote our first song of the same name. I think Judith wanted us to be the British Simon and Garfunkle but unfortunately things didn;t work out. I would just like to say thank you for this article. It has brought back some very special memories of great times. Hey everyone – I’m a writer in the USA working on a book about Paul Simon. Am very eager to hear from anyone who knew Paul during his mid-60s sojourns to the UK, and anyone who knew Judith Piepe, Kathy Chitty, David McCausland or any members of the folk community in & around London in the mid-60s. Please don’t hesitate to contact me at: peteramescarlin@gmail.com. Thanks very much! I met Judith Delft, as she was then, in 1993 in New Zealand, where she lived with her husband Steven. She certainly was larger than life; compassionate in her dealings with a mutual friend of hers and mine, a man dying of AIDS. It was a privilege to meet her and talk with her, about London, about the war, about music, about Arty (Garfunkel) as she called him, and about the Krays. To Steve Bromfield. So glad to see that you are alive. We knew each other 1965/6 when you were with Terry Redwing. ‘Cousins gigs and shacking up there in Shadwell with dear Judith. I used to be “Rant Gable” then. Please do get in touch mate. Beflaot@gmail.com I actually did get an electric album together 1998 with some serious musicians. Hope you get this. Regards, Danny. So interesting to read all these memories of Stephen and Judith. Stephen (now Simcha) Delft is my brother – which made Judith my sister-in-law. I visited the flat, 6 Dellow House, a number of times when I was young and met Paul Simon and Art Garfunkle there in about 1967. For anyone who remembers ‘The Patriach of Glastonbury’, I was the person who made their bear costume! I also made Judith some caftans around this time, and I still cook the spiced red cabbage dish she showed me how to make in the compact and exotic smelling kitchen of the flat. She was a wonderful person who had a fascinating life story. The BBC recently showed a film of her during its programme on the British folk scene. Simcha is still living happily in New Zealand and is now married to Alys. So interesting to read these memories of Stephen (now Simcha) and Judith. I am Stephen’s sister- which made me Judith’s sister-in-law. I visited the flat at 6 Dellow Street a number of times when I was young and met Paul Simon and Art Garfunkle there around 1967. For those who remember ‘The Patriach of Glastonbury’ I was the person who made their bear costume! I also made caftans for Judith around that time. I still cook the spicy red cabbage dish which she showed me how to make in the compact and exotic smelling kitchen of the flat. 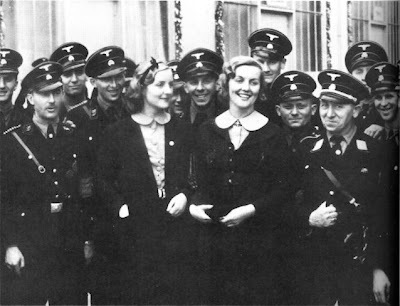 Judith was a wonderful person with a fascinating life story. The BBC recently showed a film of her during a programme about the British folk scene. Simcha is still living happily in new Zealand and now married to Alys. Judith gave me a half Siamese kitten, my first pet, its mother was called Saturday or Sunday. Judith had two Siamese cats I can’t remember which was which. I remember Aerial her daughter. I also remember Judith was a collector of waifs and strays and she liked to feed me. I was seven or eight. I used to work at Wellclose Square that was between Cable ST and The Highway,Do anyone know if it is still there?I am talking about in the sixties.I worked for a transport company called Ralph Ansell. I lived at 10 Dellow house and Judith Piepe and Stephen Delft (now Simcha) at number 6. I was friend and musical partner of Brian Jones. I was sort of adopted by them and spent more time with them than at my flat. Dellow house is still there in Dellow street. I lived on the fifth floor and there were no lifts. I remember coming home from school and stopping on the second floor to listen to the musicians (including Paul Simon) that regularly played on the stairwells. It had a really good reverb there. I stayed with them until they departed for New Zealand. I have been trying to contact Brian for a while with no luck so Brian if you read this please contact me via facebook. To Val Richards. Judith’s siamese cat called Saturday was a boy and the female was called Aurora. Saturday was a very smart cat but Aurora was pretty but dumb. I wrote a song about Saturday when i was eight or so. Wow memories flooding back. Hi Django. I was in the Patriarch band with Stephen, Andy McColl, Phillip Terry and Malcolm Fraser on mixing desk – I’m the one who walked off and let them down so badly (eternal shame on me!) I remember you well and also Saturday the cat – Judith taught me how to communicate with cats using Saturday. Hope you’re doing well. Wow, I was just remenising about when I was a youngster and my Mum and I used to visit Rochdale to see her friends Jonny (Jack) and Brenda Woolley. They often talked about their son Steve (who changed his surname to Delft) and the famous people he had contact with (Elton John & Kiki Dee I seem to recall and others). Rochdale Mashers and Oldham Tinkers were also mentioned. I remember hearing he’d married Judith. 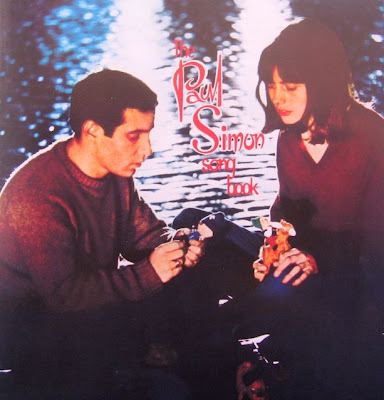 On Googling his name and finding a site mainly about Paul Simon and Cable S t I was happy to find info about Stephen…….and then a comment from his sister Rosemary….whew the childhood memories are floodind back. If either of you fancy contacting me my email is jonthebike@hotmail.co.uk. 2016 post update to this very informative and wide ranging subject. Where to start? In Stephen’s heavily curtained living room, perhaps. To get there, you got off the nearest Tube, and started to climb – up what I recall as dark maroon tiled stairwells – to the flat door. I believe Brian Jones and numerous other luminaries had ‘jammed’ in the stairwells because of the knock-out sonic reverb you could get off the walls. Anyway, I had visited, as a not-famous guitarist to get my Ibanez action ‘lowered’ – this by shaving micro-mm from each fret but not disturbing the overall balance of string heights-per-fret-per-string. Not a job for the non-pedant you might think. “Ah”, says Stephen (as he then was) holding my guitar neck horizontally to the light, “I see” What he actually saw was one of the numerous cats, boldly walking along the fretboard of my guitar. “Ah, do you know, I think I prefer cats to humans!” – seconds later, the curtains were dashed open by Judith (I presume) she never introduced herself, but immediately engaged me in conversation, whilst pouring tea: “you are from Romford” – “yes, well” “The market place used to be full of sheep” “Oh” “Yes a real country fair” “Oh” “Have you been?” ” I’m from the East Midlands – just got a flat there, actually” “Oh” Swish of curtains, and gone. Classic stuff – pure Dickens. Stephen’s skill as a luthier was beyond adjective – he took my decent factory produced Ibanez and turned into a slick virtuoso-quality neck that even I could amaze myself on. What a man! Hope he lived (survives?) in NZ still. “America” ´has to be one of the best songs of all time and that 6/8 timing and lack of rhyme makes it unique. Because I so love the story of Paul Simon and Kathy in it, Google eventually got me to NickelintheMachine, and Dellow House. It´s right next to Shadwell Stn where I get off the tube when I come up to London. I had to go and knock on the door, and see what amount of tourism it gets on the musical tourist trail …. Answer¨….none at all. The people that lived there were kind enough to let me in, but nobody had ever mentioned the famous musical ancestry to them. Since they were Simon & Garfunkel fans, my revelation produced first some disbelief, and then some screaming with pleasure. ¨How strange to live where all this used to take place, and to be so unaware.